I was at Foster & Dobbs three times this week. I may have a problem. Last night they were having a meeting of the occasional DIY Cheesemakers group with a demonstration by Claudia from Urban Cheesecraft. She has started her own line of cheesemaking kits with products all sourced on the west coast. The whole kickoff for the FUCheese cheesemaking adventure was the Ricki Carroll mozzarella kit that Nicole got for Christmas two years ago. Ricki Carroll has great products but her supplies are in New England so you have to order and wait. It’s great to have a local option and Claudia’s kits are super adorable! Claudia did a mozzarella demonstration for us and she was absolutely charming and very clear. She has a great, relaxed attitude about cheesemaking — you can’t mess it up! While cheesemaking is a science it is very often an inexact science so it helps to have a cheerful can-do attitude for when things go a bit sideways. I picked up some great tips from her and look forward to sharing them when Nicole and I do our own mozzarella demo for some friends next month — eek! Claudia is planning to be at the Wedge Festival (be there!) with her kits and may also do a ricotta demonstration on the main stage. 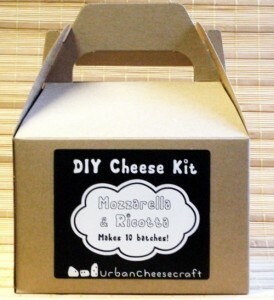 Kits are such a great way to jump in to cheesemaking, I highly recommend picking one up. You can find out on her website which stores in Oregon are selling them or order from her etsy shop. They would make such great gifts! Also, if you want to get notified when Foster & Dobbs do their next DIY cheesemakers meeting or to hear about any of their other many events, sign up for their mailing list!